Settings that control the disassembler. The runtime descriptions and command-line parser for these switches can be obtained from disassemblerSwitches. Definition at line 248 of file BasicTypes.h. Name of the instruction set architecture. 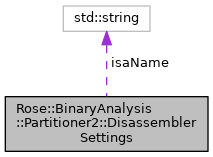 Specifying a non-empty ISA name will override the architecture that's chosen from the binary container(s) such as ELF or PE. Definition at line 249 of file BasicTypes.h.